James Bond 007 Tribute Artist, Variety Acts | David Levin Ent. 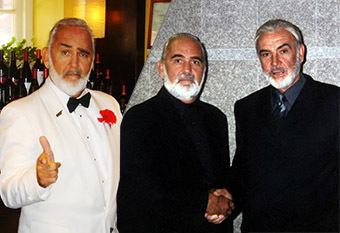 David Levin Entertainment’s James Bond 007 is an Award winning Sean Connery Impersonator and Lookalike. He’s been Sean Connery’s double in films and has appeared on Jay Leno, Oprah and many other tv shows. His recreation of Sean Connery’s voice is the highlight of any event. He’s the perfect emcee for any Bond-themed event! The James Bond 007 Tribute Artist is available in Las Vegas, Palm Springs, Florida and virtually anywhere in the U.S. and around the world.